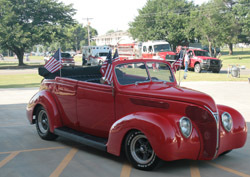 Back in high school I once owned a 1946 Chevrolet pick-up. Dreams of what it could be mirror what this 1938 became. Steve bought this show car in dream condition. He has been told it is likely a “one of a kind.” A collector could not recall a 1938 four-door convertible. Standing next to this beauty last Friday brought back many memories. As Steve showed me around the car he might have spotted me drooling. From under the hood to under the convertible top I could only think – amazing! We Littletons have cars in our blood. Grandpa, uncles and cousins all have dabbled in either new or used cars my entire life. Car lots were a Saturday past time. Several features of this care set me to thinking. The 1939 Packard was the first automobile marketed with optional air-conditioning; a $274 add-on. Yet, open the glove box on this red beauty and there sits the controls an air-conditioner. From the stereo to the modern engine in this old body one quickly learned this is only old in its body style. The makeover is complete. Steve told me the car could cruise from Tuttle to California at 70 mph and not miss a beat. Does Steve drive this everyday – not a chance. It rests with his 1969 Camaro – saw the photo from his cell phone – and his Corvette Stingray. None of them are daily drivers. Steve’s 1938 represents a clash in sensibilities. We want the new and like the old. Church life experiences much of the same. In our new church buildings we want new – pews or chairs, air-conditioning, woodwork, musical instruments, kitchen, paint, and on and on. But, when it comes to what we hear whether in sermon style or musical style we want old. There is often more a fixation on the sound than the substance. Why, sometimes I think we could sing some old hymns or songs with seriously flawed theology and be just fine. Add in a more contemporary sound with solidly orthodox lyrics and panic sets in. What’s more, insert culturally adaptive language to help bridge the language of Zion and quickly notions of jettisoning the cross and atonement become unwarranted accusations. We like our HDTV, our automobiles with bluetooth and navigation systems, and the latest computer technology. But, we constantly ask for more of the same when it comes to the atmosphere at many a church. Clashing sensibilities do not mean an end to unity. Instead, maybe like this 1938 we find ways to move forward together – the new and old, the young and old. Seemed to work for the people of God in the Scriptures – surely we have not advanced to the point it will not work today.